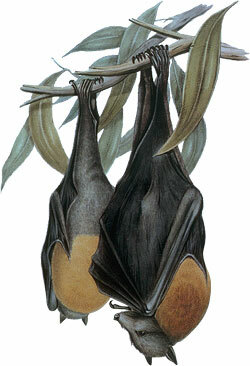 The bats are divided into two taxa. The bats with which most people are familiar belong to the Microchiroptera. Microchiropterans, or "microbats," generally nagivate by sending out pulses of high-frequency sound and hearing the echos. They tend to have short faces and well-devloped tails, and lack a claw on the second finger. Microchiropterans are found everywhere on earth except the polar regions. The Megachiroptera includes the so-called fruitbats and flying foxes of the tropical forests of India, Africa, Asia, and Australia. The picture at right shows a typical megachiropteran. Megachiropterans have a claw on the second finger of the wing. They include the largest known bats; Indonesian flying foxes may have wingspans of up to six feet (two meters). They have longer muzzles than microbats (hence the name "flying foxes" for some species) and, while a few species can navigate by echolocation, fruit bats generally navigate by sight and have large, light-sensitive eyes. Most fruitbats are helpless in total darkness but can see very well in dim light. Which other mammals are related to the bats? While bats are highly specialized for flight, they share anatomical characters with the Insectivora, the mammalian taxon that includes shrews and moles. These characters, however, are probably symplesiomorphies, fundamental to mammals as a whole, and not indicating a close relationship between bats and insectivorans. Bats are thought to be related most closely to the Dermoptera, a small order of mammals (two species) which includes the colugos or "flying lemurs" of the Phillippines. Colugos do not fly, but can glide using a web of skin stretched between their arms and legs, rather like flying squirrels (to which they are not closely related). Perhaps surprisingly, bats are also related to the Primates, the mammal taxon that includes lemurs, monkeys, apes, and humans; and to the Scandentia, the Asian tropical tree shrews. All these mammals are sometimes classified together in one large taxon, the Archonta. Find out more about bats and how they relate to other mammals at the Tree of Life site.